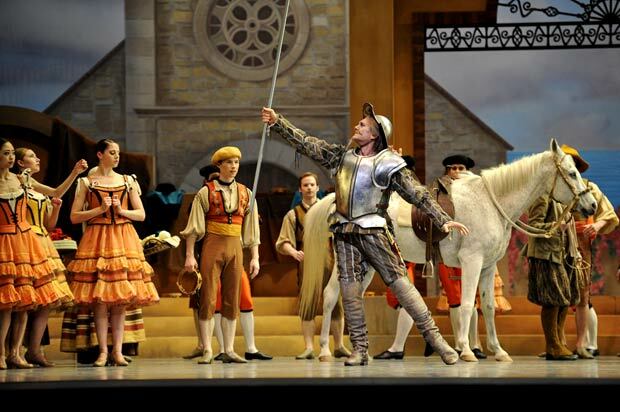 Don Quixote is not one of my favorite ballets. Like cotton candy, this piece of fluff melts on your tongue the second you bite into it. Friday, April 27 at San Francisco’s War Memorial Opera House, it is opening night for the San Francisco Ballet’s new production of this ballet with all new costumes and sets by Martin Pakledinaz. I have hopes that they will be better than those designed by Jens Jacob Worsaae which were rented from the Royal Danish Ballet in 2003 when this Spanish-flavoured confection first premiered here. The lights dim, warm expectant applause for conductor, Martin West, as he mounts the podium, then half a minute into the overture when the second musical motif begins, a small number of the audience breaks out in snickers and guffaws to accompany the absurdly circusy rendition. I do feel embarrassingly vindicated. This sow’s ear of a score by Minkus can never approach the silk-purse compositions of Tchaikovsky or Prokofiev, but in the hands of the wrong conductor it becomes a parody of itself. After the Prologue the curtain rises on a sunny plaza and I see Pakledinaz has given the corps de ballet costumes that are in bright colors or earthy tones, not pastels like those by Worsaae. But then the toreadors come in looking like characters out of some kind of Disney World España. The jackets and pants are tangerine with dark teal vests and designs going down the side of the leg. Espada is dressed in equally eye-popping day-glo yellow with hot pink trim. Why doesn’t this palette relate in some way to the costumes already on stage? And the saturated blue ruffles with pink edging that Mercedes sports is also puzzling. 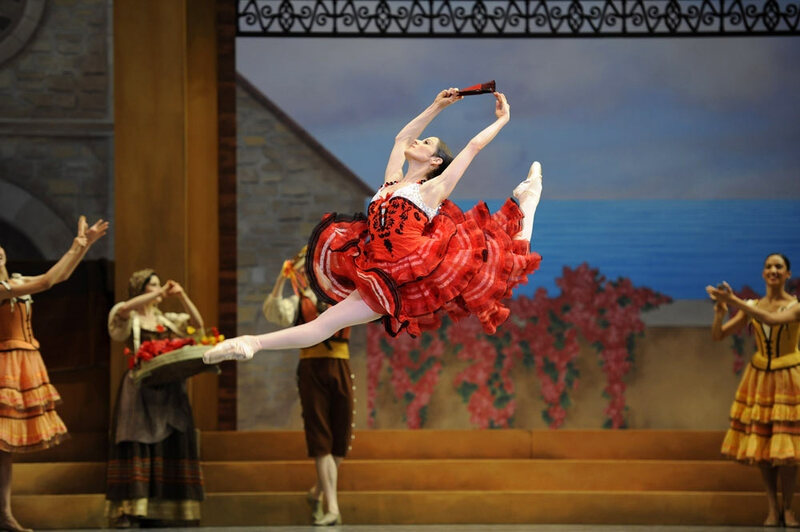 At least Kitri and Basilio, danced by Vanessa Zahorian and Joan Boada, are in the more traditional red, black and white. The principal dancers and soloists dance well for the most part. Zahorian is happy and buoyant, technically adept, and a pleasure to watch. Boada is, as always, a consummate artist, sailing effortlessly through the air, insouciantly lingering at the finish of his pirouettes, and above all paying meticulous attention to his partner, both concealing the mechanics of showing her off to best advantage and interacting with her as a character in the story. With his sure touch he managed many of the supported turns with only one hand as is possible given Zahorian’s natural spinning-top propensity. Sarah Van Patten and Jean-François Vilanoba as Mercedes and Espada are fine, though a bit more fiery passion wouldn’t hurt either of them. Again, the big disappointment is that the corps de ballet doesn’t put enough energy into creating a vibrant backdrop or frame for the whole ballet. The entire stage needs to be filled with a bustling populace, who act out their own little stories while being spectators to the main narrative. In the Gypsy Camp, the first scene of the second act, the costumes for the gypsies are quite well done with the exception of the Gypsy Woman’s which has a wildly-colored skirt of a cut completely different from the others and far too many sequins on the bodice. 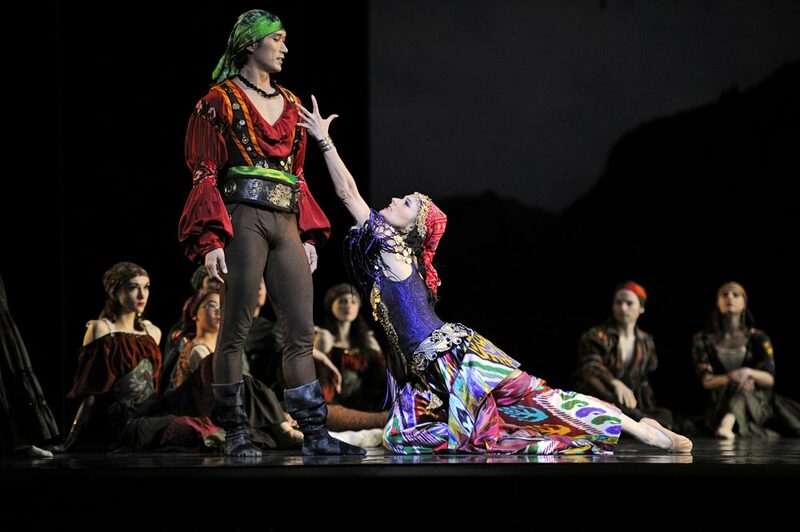 As for the dancing, Hansuke Yamamoto is razor-sharp and commanding as the Gypsy Leader, as he leaps high and whips his legs through the air and Danielle Santos as his paramour is very good in her longing sensuality. Here Artistic Director, Helgi Tomasson, as co-choreographer/stager, interpolates a quiet love pas de deux for Kitri and Basilio. The ballet is already too long and this couple has enough dancing together that this addition is unnecessary, especially when the music conjures up a 1930s English seaside hotel ballroom replete with faux-gypsy orchestra. In scene two of Act II, Don Quixote’s Dream, the lovely misty green glade and the pale sea foam costumes set the right tone. Despite the regal dancing of Sofiane Sylve as the Queen of the Dryads and the brilliant sparkling Clara Blanco as Cupid, there are too many dancers crammed into too little space and the resulting traffic jams create a nightmare rather than a somnolent vision. Closing the second act, the Tavern scene is more of the same; repetitious dancing by all concerned and some decidedly questionable costumes for Mercedes and Espada. Both are completely black and with a Las Vegas-inspired amount of black sequins on Espada’s. They provide camouflage against the black marley floor and shadowy interior, and most of the dancers’ movements are lost. The brevity of the third and final act, The Wedding, is much appreciated. Most of the costumes are befitting the nuptials. Pink for the bridesmaids, beige with black trim for the guests dancing the Fandango, and white for the bride and groom. Only Mercedes in a pale blue lace-trimmed frock and the toreadors in the outfits from the first act seem out of place. And finally the too-frequently-performed grand pas de deux, all technical tricks with a touch of flirtatious romance, that Zahorian and Boada dance with verve. I come back on the following night, Saturday, April 28, to see Maria Kochetkova and Taras Domitro in the lead roles. Both dancers trained at schools (Russian and Cuban respectively) where traditional classical ballet is studied down to the position and intention of every cell of the body and with an emphasis on artistry as well. It shows the moment they step on the stage. Their mime is so expressive that the entire meaning of the stage action is transparently clear. The story now has a plot and the characters are relating to each other. They catalyse the corps de ballet into an energetic and engaged crowd even if the mime isn’t different. And the music under conductor David Briskin is far more nuanced as he smooths out the rhythms. He uses a legato touch and lets the strings sing instead of allowing the winds and brass to punch out the pulse. Kochetkova and Domitro, together and separately, dance extraordinarily well. They don’t have the elusive chemistry that she has with Boada, but they still are very much in tune with each other, both musically and artistically, and make a very satisfying partnership. Other notable performers are Sasha DeSola and Dana Genshaft as Kitri’s friends. They constantly smile and laugh, turn to each other to comment when the plot takes a turn, and add a lot of flair to their dancing. Sofiane Sylve adds a dagger-sharp edge to her Mercedes, while Vito Mazzeo is sinuously seductive as Espada. In a third cast on Thursday, May 3, Frances Chung makes her debut as Kitri with Vitor Luiz as her Basilio. Her technique is phenomenally concise and hopefully her acting ability will grow to match. At times she seems comfortable in the role and then gets caught not knowing what to do next with her face. That is something more experience will help along. Luiz is just the opposite. He is always in his role and deftly shades his every encounter with the other characters. Though he does manage a few gorgeous jumps, he seems to be having an off-night technically. For all three performances, Pascal Molat plays Sancho Panza with superb timing and wit. San Francisco Ballet has many talented dancers who deserve to perform in ballets that offer them artistic challenges. They need to have the proper coaching to help them create both the individual roles and a company cohesiveness on the same level as companies like the Royal Ballet, the Bolshoi, the Mariinsky or the Paris Opera. A few seasons ago when Wayne McGregor set Eden Eden on them, I thought I was watching an entirely different company they were so inspired by fresh ideas. I would certainly love to see more of that revitalisation in the future instead of other listless productions like this one. Thanks you for an insightful review that pulls together all the elements down to the detailing in the costumes. Very informative!